But there's another side of Bryce Canyon beyond the popular and easy-to-reach overlooks that circle the rim. A hike into the hoodoos will give you a totally different kind of Bryce Canyon experience and Greg discovers a trail just outside the park that leads to a big surprise the Motion-crew didn't see coming. Bryce Canyon has several easy-to-reach vistas with breathtaking views of this stunning landscape and the red rock formations below. Greg takes in these incredible views before venturing below the rim and into the heart of the hoodoos. Greg and the crew spot a trailhead just outside the park and decide to investigate. See why taking a 'freelance' approach to trip-planning can sometime pay off big! The trail leads to Mossy Cave and its enormous icicles. 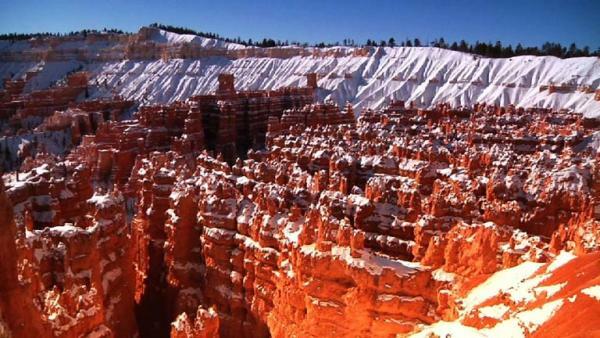 Much of Bryce Canyon's beauty can be seen while staying close to the car but if you spend a little extra time and effort, an amazing new world of scenic wonder awaits. If you're looking for a quaint and cozy place to rest your head after exploring Bryce Canyon National Park, the Bryce Country Cabins might be exactly what you're looking for.